'Place' is generally conceived as being 'space' imbued with meaning. Thus, it refers more to the meanings that are invested in a location than to the physicality of the locality. Sometimes, though, it is the biophysical characteristics that are important in being a foundation for those personal meanings. Landmarks and significant features in the landscape contribute to sense of place by providing an icon to which symbolic meaning can be ascribed. Thus, Mount Wellington, towering over Hobart (Figure 1.1), becomes the representation of place for many Hobartians. Constructed landmarks can function in much the same way. For example, the Sydney Harbour Bridge and the Opera House could easily be significant for people in Sydney (see Chapter 23). Locations where people gather to play or to meet and share stories, such as parks, shopping malls, cafes and pubs, can also become special because of their social meaning. Certain locations can also develop a special quality because of the type of experiences people have there. The spot where a first kiss or a marriage proposal took place or the location of the honeymoon might be special forever. Locations where people go for holidays, their favourite fishing spot, or some favoured spot where they find solace (see Chapter 21) all give a sense of what is meant by 'place'. Place, therefore, is the coming together of the biophysical, social and spiritual worlds. Simply put, place is space that is special to someone. 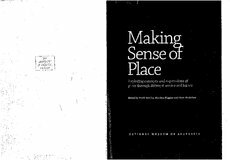 The personal meanings that turn space into 'place' become embedded in people's memories and in community stories. They can be associated with both positive and negative feelings.